The performing arts at Ohio State cultivate a vibrant environment where unlimited opportunities exist for creativity, free expression, real-world experience, strong traditions and community engagement. The performing arts — the Department of Dance, Department of Theatre, and School of Music, which includes The Ohio State University Marching Band — form a centerpiece to the university, with highly professional artists on the faculty providing unmatched excellence in education, innovative performance and creative research. By integrating the arts on campus and connecting the arts at Ohio State with professional arts organizations in the Short North and downtown Columbus, we create unprecedented opportunities for collaboration among students, faculty and professional performing artists in the community. We have relationships with CAPA (Columbus Association for the Performing Arts), Columbus Symphony Orchestra, Opera Columbus, Short North Stage and other professional groups. These “Town and Gown” collaborations open doors to new partnerships and extend our students’ experiences throughout the community. 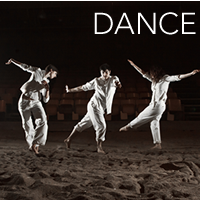 As one of the premiere dance programs in U.S., the Department of Dance is at the forefront of contemporary modern dance through choreographic and performance exploration, creative use of technologies and reimagining the documentation of dance traditions. Events each year include the major dance concert, Dance Downtown, presented on the Riffe Center’s Capitol Theatre stage in downtown Columbus, undergraduate and graduate dance concerts, faculty performances and guest artist presentations. The Department of Theatre is a vibrant, active community committed to teaching and training the artist-scholars of the future. The creation of new work is the lifeblood of the theatre and it is important to provide opportunities for students to develop and create new performance work while maintaining connections to history through productions of classic, modern and contemporary texts. 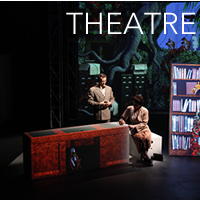 Each year the department presents numerous productions on three stages on campus, as well as performances created by undergraduate and graduate students. 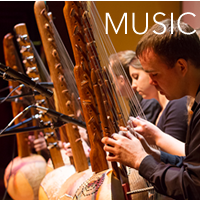 At the School of Music, dedicated people make exceptional music, stimulate artistic growth, explore educational methodology and conduct ground-breaking research. The school has more than 20 student ensembles and presents more than 300 concerts, recitals and performances each year, on campus and in Columbus. Some of these concerts include opera performances, jazz concerts, the annual Celebration Concert, visiting artist recitals, faculty performances and the symphony orchestra. 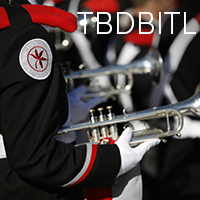 For 140 years, The Ohio State University Marching Band has provided the soundtrack to the Buckeye experience. The 228-piece "Pride of the Buckeyes" is one of the few college all-brass-and-percussion bands in the U.S. Many marching band innovations were developed at Ohio State, including floating and animated formations, script writing, and the fast cadence with a high knee lift. The band's Script Ohio is considered by many to be the most memorable tradition in college band history.